The Masters week is the biggest golf betting week of the year. I was lucky enough to hit Patrick Reed at 50/1 for a nice payday last year, so I’m hoping to add another Masters winner this year as well. Tiger is one of the favourites heading into the tournament, so we can expect a ton of media attention on the tournament all week long. Below I will give my four outright winner picks for the 2019 Masters. 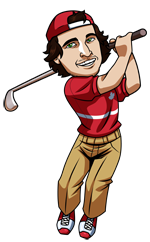 I will be using the best odds available for the golfer from any of our top rated betting sites for Canadians. I always like Dustin Johnson to win golf tournaments. I consider him the most talented golfer on tour, and this year even though he’s heading into the tournament without a ton of fanfare, he’s quietly been playing some very solid golf, and he seems to be playing with a laid back confidence this year, which I think will bode well for him at Augusta. People seem to still question his record at The Masters, but he’s put together 3 straight top 10’s in 2015, 2016 and 2018, with 2017 being the year he looked unstoppable heading into the tournament before injuring his back. Anytime you can get DJ at double digits I think he’s a solid play. These next three picks are all guys who have yet to win a major, but have had great careers so far and are due to get the big win. Rickie is the first and at odds of 18/1, I’m happy to take him to break through this year at Augusta. He’s playing solid golf, but it’s often one round in a tournament that has prevented him from really racking up the wins this year. If he can avoid the one mistake that puts a triple on his card this year, I think he has the talent to attack Augusta. He finished second last year, and he’s finished 12th or better in four of the last five years. Rickie has actually played Grand Slams pretty well over his career with 3 second place finishes. It’s time he gets over that hump and gets the win. Hideki is another top young player who after six very solid seasons on the PGA Tour, is now looked at as a veteran who is somewhat due for a major win. He’s also quietly been playing solid golf this year including putting together a great weekend at The Players last month to finish T8. I think Matsuyama is rounding into form this year and over the last few years you would not have seen his odds this long for The Masters. He’s finished top 20 at Augusta each of the last four years, so his game translates well and a good week could result in a big win. Kuchar has been in the headlines a lot this year for things other than top results. It’s been lost in the shuffle a bit how well he’s been playing. Kuchar had another solid outing last week finishing T7 at the Valero Texas Open, and he’s just been playing really solid golf all year. Kuchar has two wins on tour this season as well, so he seems to be shedding that top 10 finisher, but not a winner, reputation he’s had over the past few years. Kuchar is 8 for 8 in cuts made at The Masters, and has finished top 30 in 7 of those 8 tournaments. He also has 4 top 10’s in that span, so his game is obviously a great fit for Augusta. ***Also, check out our how to bet on the Masters in 3 steps article for a breakdown of how to get your bets placed this week.